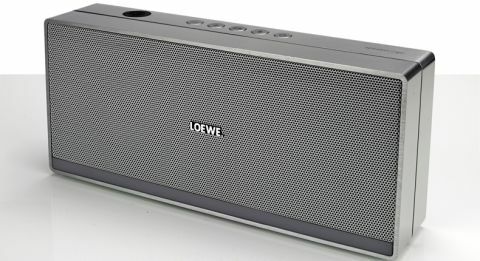 Loewe Speaker 2go review | What Hi-Fi? The Loewe Speaker 2go is sure to catch your attention. It isn't because of its shiny-metal design, or its powerfully loud and punchy sound. It's because it offers all these qualities for just under £200. It's an impressively affordable wireless speaker, and warrants an audition thanks to just how much fun it can sound. Boy, does it go loud. For such a compact speaker we can carry with one hand, the Loewe packs a substantial punch: 40 watts of amplification powering two full-range speakers and a subwoofer. Crank the volume up and your neighbours will be calling. We wouldn't push it too far, though, as a hard edge creeps in. Stream David Bowie's Moonage Daydream on a more sensible level, and the Loewe delivers a solid, toe-tapping performance. The Loewe gives plenty of low-end grunt and aggression to rock songs, with Black Sabbath's Iron Man delivered with appropriate weight and crunchy, meaty guitar solos. There's plenty of muscle. Loewe juggles tonal balance admirably: basslines dig deep enough to rumble while also remaining taut and controlled, and the treble has just the right amount of sparkle without being too bright. It's not quite the perfect all-rounder, however: the Libratone Zipp BT is a better bet if you're looking for refinement and transparency. Next to the B&W T7, the Loewe could do with an extra dose of clarity. Voices are packed with character, but can sound rather thick and indistinct. The B&W does a better job conveying subtle, dynamic shifts and the layers of harmonies surrounding a note or vocal. Dynamically, the Speaker 2go sounds a little congested. The Loewe does have a trick up its sleeve to help spread sound further. Press down on the speaker and a discreet rubber-stand pops down, propping up the Speaker 2go by exactly 7.5 degrees. Loewe claims this tilt helps disperse sound around a room - it certainly is more direct and open to our ears. The pop-out strip is a little fiddly - the Bayan Audio X3 has a similar, if more elegantly executed, tilted design. Alongside aptX Bluetooth for wireless streaming and a 3.5mm input for plugging in various music players. You can also connect to the speaker with just one tap. See that black circle on top of the unit? That’s the NFC (near-field communication) tag. Tap any NFC-enabled Android or Windows OS device to that black spot and you’re connected in seconds. Make sure you have Bluetooth turned on first for actual music streaming, though. The Loewe also features a USB charging port. It might not support playback, but being able to charge your smartphone on-the-go is useful. We'd be careful of overusing this, though, as Loewe's battery lasts only eight hours. Less useful is the Loewe's built-in microphone, as phone calls can sound rather muffled. Build is solid, but we notice the front-grille on our sample isn't flush with the casing all the way round. Loewe offers a free iOS/Android app. It has a slick, minimalist interface with an emphasis on album artwork – but it doesn’t do a lot apart from being an alternative to your smartphone’s native music player. There are no extra EQ or speaker settings, and while it’s simple enough to use we aren’t swayed from using Apple and/or Android’s familiar music apps. The internet radio section is more fruitful, and makes it a worthwhile download. It's impressive that the Loewe Speaker 2go has kept its four-stars with new rivals on the scene. There are speakers with greater clarity and insight, but the Loewe's enjoyable sound is well worth a listen.